Do you encounter troubles with the process of window cleaning around your home or business premise? Your struggles are not enough to remove stains, water streaks and dust build-ups from glass surfaces? The professionals of window washing in Friern Barnet will give you a hand! Say bye-bye to the innumerable hours of polishing and wiping – the skilled and experienced team members will manage this problem. You will be able to enjoy your free time – just let us do this slow and tiresome chore for you. Our professional approach will grant you lots of bonuses. We also provide our professional services in nearby areas: Havering, Hainault, Chadwell Heath, Chigwell, Barkingside. You can depend on the team - they are the true experts of window cleaning. They all have gone through diverse training sessions, so you can receive second-to-none service for all glass surfaces types. What we can polish includes: small, double, garden windows, bay or sash windows, French doors, patio doors, conservatories and roof windows. Your house can be improved instantly with our assistance. Get in touch with us every time you need great window cleaning for your house or workplace. You can enjoy perfectly looking work environment with the help of the adepts of commercial window cleaning. You can count on our high end services for all types of business premises. If you own a small shop, we can carefully polish its windows by using water fed extension pole system – it allows us to reach up to the fourth floor. If you require flawless look for the glass panes of a skyscraper in London and the surrounding areas, we will put in use our rope access gear. In both cases, you will appreciate superb results in no time. We are glad to use the most effective methods to make sure that you receive the optimal window cleaning. The glass surfaces of your house will look spotless after we utilise water-fed extension pole cleaning system and jet washing on them. We use our vans to supply the poles with water and we can reach up to the fourth floor. In case you request cleaning of windows on taller buildings than that, we have rope access team available. Call us on 020 3746 3113 and get in touch with us – these efficient techniques will bring you results in no time. 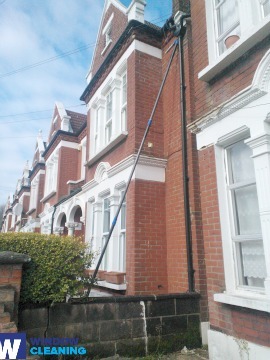 Benefit with our swift and professional domestic window cleaning in Friern Barnet. We clean the windows of your home both inside and outside. The products we use are safe - you will love the perfect results and make a green choice. In addition, we use only purified water. Don't hesitate, ring 020 3746 3113 and order our second-to-none services. Our customer care staff will take care of you – they are on-call 24/7. We have other ways of booking – our request a cleaner online form or just chat with our customer care assistants.